Mugs are an incredible way to promote your business, cause or event. Not only are there limitless choices of color, size and style, but there’s lots of room for whatever message suits your need. Here too you have lots of options. Business name and logo? Always a winner and a lasting reminder. Tag line you use for your business? Awesome choice. Your logo/mascot alone? Cool. 1. You can make anything in them — drinks like cocoa, tea or coffee, soup or even treats like brownies and cookies. 2. Just for you size — super personal. If you don’t think this is true, you’v probably never gotten between a mug lover and their favorite mug? It’s not pretty. 3. Feels good in your hands — just the right size to cradle comfortably between two hands. No other beverage container does this in quite the same way. 4. Collectable and suitable for display — collection can be reminders of trips, people or special events — all good, positive things. 5. You can never have too many! And there’s this. The latest ASI Impressions Study finds that promotional products like mugs deliver an amazingly high advertiser recall for 85% of the consumers who were surveyed. There were thousands of interviews in sites all across the U.S., Canada, Mexico, Europe and Australia. People remember promotional products, and feel good about the brands behind them. 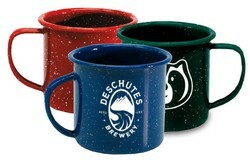 Even more reason to consider a mug for your next promotion, give-away or event.